Always known as "the quiet one", The Beatles' lead guitarist embraced his spirituality and liberally absorbed his love of Indian culture into his music. He launched his solo career with the 1970 triple solo album All Things Must Pass, which was an astonishing work reflecting the frustrations of being so heavily overshadowed by Lennon and McCartney in the Fab Four. 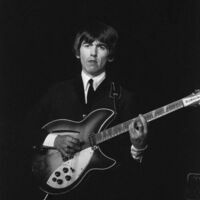 Part-produced by Phil Spector, the album also featured My Sweet Lord, a Number 1 in both the UK and US, though he had to surrender his royalties after a court ruled he'd unintentionally plagiarized He's So Fine - an earlier hit by The Chiffons. Harrison also produced the Hare Krishna Mantra hit single and organized the 1971 Concert for Bangla Desh, featuring Bob Dylan, Ravi Shankar and many others. He continued to record sporadically, but diversified into movies, forming the production company HandMade Films. However, he was back in a band in 1988 with The Traveling Wilburys before returning to the charts as a solo artist with When We Was Fab, a nostalgic reflection on The Beatles. Harrison died of lung cancer in 2001. ℗ 2011 G.H. Estate Limited, under exclusive license in the United States to Universal Music Enterprises, a division of UMG Recordings, Inc.